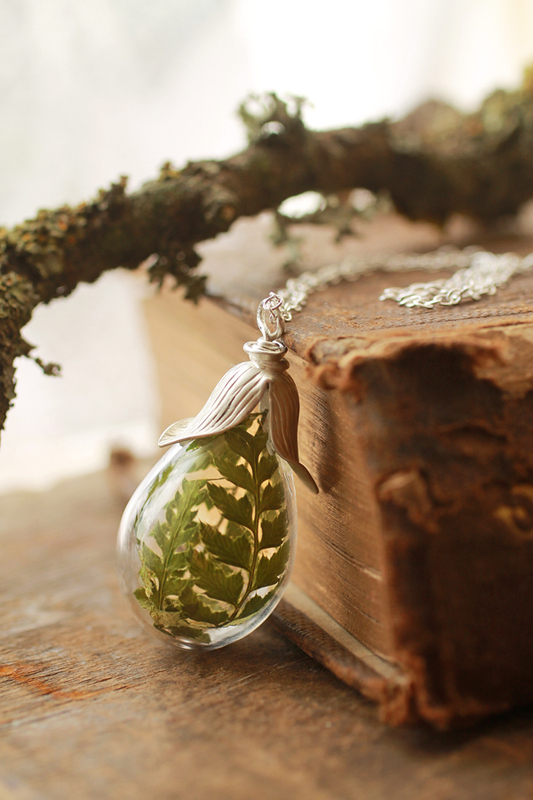 Like some strange thing in a natural history museum, this unusual botanical necklace contains a real moss green fern leaf, which I gathered from a local woodland last summer. When I brought these delicate little leaves home, I then pressed and preserved them inside an elegant glass locket, before stringing them on a sparkling silver chain. In wearing this pendant, you will always bring a little piece of the wild woods with you. A thread of connection, that keeps you intertwined with nature wherever in the world life takes you. It was designed to conjure up memories of a thousand whispering leaves, the smell of damp, crushed moss underfoot and golden dappled sunlight on the forest floor. The locket is glass, while the Art Nouveau style clasp is silver toned and the beautiful chain is 925 Sterling silver.